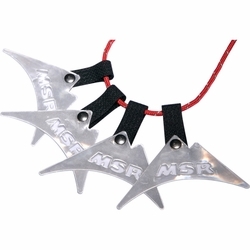 MSR Reflective Guy Line Markers. Guy lines can make a busy campsite into a maze of tripwires. Reflective guy line markers reduce accidents and prevent damage to your tent, while making it easier to find your tent or cache at night. Simple hook and loop straps make it easy to attach markers to any cord or guy line.